Pick up some of these cigars for me! 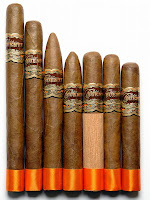 The Casa Fuente cigars are sold only at the Casa Fuente store (a joint venture of Robert Levin from Holts and the Fuentes), located in the Forum Shops at Caesar's Palace in Las Vegas.The blend originally started out as an Opus X blend, but was changed somewhat from that initial profile. It boasts a Cameroon wrapper grown from the original Cameroon seeds planted by Rick Meerapfel. Smoking the Casa Fuente is as enjoyable as visiting the cigar’s namesake boutique and lounge, which the Fuente family opened in 2005 at the Forum Shops at Caesars Palace in Las Vegas. The contents of the Cameroon leaf–wrapped blend remain a secret, but the cigar has a familiar mellow taste and peppery undercurrent that suggest the tobaccos likely come from the same Château de la Fuente farm as the leaf used in the highly acclaimed OpusX. After tasting the cigar, few of our panelists would dare question the value of such a trip. In case you're wondering, yes, I have smoked one. That's why I'm longing for more! In Part 2, next week, I'll focus on the store itself.